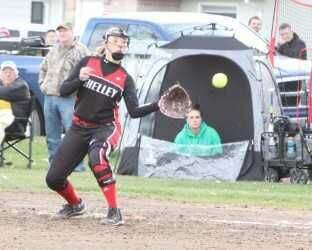 Shelley’s catcher just misses ball thrown to home during Blackfoot-Shelley game. BLACKFOOT – The Blackfoot Lady Broncos just keep rolling along as they raced to their seventh straight win, this time taking care of the Shelley Russets by a final of 16-2 Thursday. The game was called at the end of five innings due to the 10-run mercy rule. Kyah Henderson and Yoleni Navarrete led the offense and Kymber Wieland supplied the pitching as the Lady Broncos dominated the action. Shelley actually held an early lead of 2-1 following the first inning, but their weakness all season long has been defense and that Achilles heel reared its ugly head once more as the Russets committed five errors in the game and the Lady Broncos seemed content to allow the unearned runs to dictate the contest. Wieland was masterful on the mound after the first inning. She allowed Shelley to score twice in the bottom of the first, but Wieland shut the Russets out for the rest of the contest, throwing a one-hitter along the way and striking out 11 batters in her five-inning stint. She threw first-pitch strikes to 13 of the batters that she faced in the game and was clearly the star of the contest. While Wieland supplied the pitching, it was Navarete who supplied the offense with help from Henderson. Navarete had a hit and two runs batted in in the game, while Henderson got a hit of her own and also reached base with two walks. Henderson and Grace Callister both had four quality at bats for the Lady Broncos. The Broncos used those walks and Shelley errors to score 16 runs and only had three hits in the game. The same two teams will square off in Blackfoot today with a first pitch at 4 p.m.
Blackfoot moved to 7-1 on the year, and a perfect 3-0 in conference play. This was the first conference loss on the season for Shelley, who fell to 2-1 in conference play, and 3-8 on the season. Blackfoot is currently tied for the top spot in conference with Idaho Falls, both teams having a 3-0 record in conference play.